It began deep in a South American rainforest in the heart of Paraguay, James May searching for the legendary Wise Old Man of the Guarani natives. Along the journey he learned of various herbs used by the locals to hasten healing or simply to maintain vibrant health and energy. He never did find the Wise Old Man, but did learn much of the healing qualities of the native plants and trees that have been used for centuries. 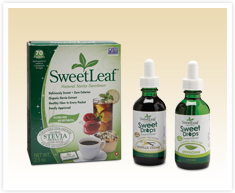 One such treasure was Stevia, a marvelous natural sweetener, which the natives used in their herbal teas, and which James May introduced to America in 1982 under the Sweet Leaf brand.